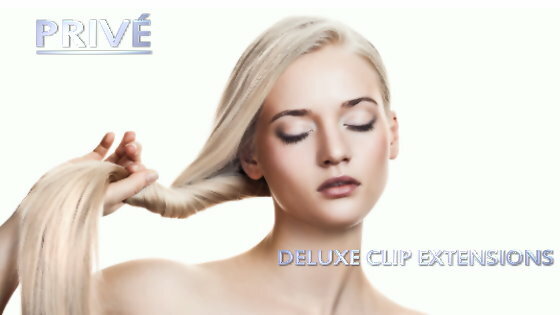 PRIVÉ Clip Extensions are Ultra High-Quality clip in extensions, that are hand-crafted in Canada. The Hair Clinic clip in extensions are available by the piece, or in sets of 5 | 7 | 9 | 11 pieces, in lengths of 14 inch long hair | 18 inch long hair | 22 inch long hair. Our Montreal hair shop’s clip extensions are available in a Standard lighter density for fine hair or a Deluxe heavier density for normal to heavier hair. Each clip extension is precisely matched to your hair color, top bottom, and side colors, which can all be different. Our clip in hair can also be custom made just for you, for an almost endless variety of single colors, 2-tones or 3-tone blends, of any standard or custom width. If you’ve always wanted to get hair extensions, but you still wanted to be able to remove them at night, then The Extensions Shop on Crescent Street Clip extensions are the perfect extensions for you! Clip extensions that will never damage you hair! Clipons that are comfortable and yet so glamorous. Clip extensions are the perfect removable and reusable hair extension system. Unlike cheaper extensions, The Hair Clinic’s human hair clip extensions won’t dry out after the first shampoo. Our natural hair extensions always stay soft and manageable, with a healthy luster. Unlike cheap extensions, they won’t thin out or turn into a mop after a few wears. Just drop by our hair extensions shop, and feel the difference real human hair extensions makes. Slide your fingers through our soft, silky human hair extensions, and you’ll know what quality hair feels like! Our hair shop’s clip hair gives your hair volume and luster instantly. You won’t have to wait years for your hair to grow. You can have long, beautiful, silky hair right now. Be ready for parties and celebrations just in minutes, or wear your gorgeous clip-on extensions all the time and feel glamorous every day. Our clip-on real human hair extensions are also perfect to make your perfect wedding even more splendid. Your graduation pictures will come out stunning – it’s amazing what a difference hair can make! Going south for the winter? Take your Montreal clip extensions with you, you’ll be able to frolic in the water all day, and then put on your extensions to party at night, and your hair will be gorgeous! With The Hair Clinic’s clip on hair extensions, you can have the glamorous and uninhibited hairstyles you only dreamed of until now. You’ll fall in love with them, every time you put them on! Our hair shop’s Clip Extensions are simply the best quality 100% Human Indo-European Remy Hair Clip Extensions you can buy, at the best possible price!